The Population Health Initiative seeks to support faculty, students and staff in conducting interdisciplinary, collaborative work across the University. The following resources are intended to support such collaboration. We have partnered with the UW’s Institute of Translational Health Sciences to develop a directory of population health-related faculty and center/institute resources located at the University of Washington. The goal of this directory is to present the breadth of expertise across disciplines and campuses that are currently working on the population health challenges we face. We hope this directory will create new opportunities for partnership and collaboration as we move toward fulfilling the 25-year vision of this groundbreaking initiative. As a means of growing this directory, we encourage you to add yourself or your center via the submission form on the site if you are not currently listed. Please feel free to also contact us if your entry needs to be updated. The Population Health Initiative organizes and hosts faculty networking sessions during autumn, winter and spring quarters. The main objective of these sessions is to introduce faculty members to individuals in other disciplines at the university who are working on similar issues, with the goal of facilitating new, interdisciplinary collaborations. Notifications of future networking sessions are distributed via the initiative’s electronic newsletter. You can receive these mailings by adding yourself to the initiative’s distribution list via our subscriptions page. The UWDC offers the infrastructure to harness innovative, but hard-to-access, data for the development of novel, high-quality research and evidence-driven policy making. Central to the UWDC is a state-of-the art computing cluster that provides access to restrictive data in a secure and computationally sophisticated environment. The impact of academic research in improving population health is far greater if institutions and researchers engage meaningfully with communities that the research is intended to benefit. The Population Health Initiative is committed to supporting UW faculty, students and staff in their efforts to include communities in their research and scholarship. Our evaluation plan highlights the importance of community engagement in explicitly measuring collaborative and community-based activities as key factors that contribute to the success of the initiative. Our guidance on how initiative-funded projects should be evaluated also calls out community engagement as a key consideration developing project-specific metrics for success. Numerous resources and publications discuss known best practices for engaging in community based participatory research or community-academic partnerships. Below is a sample of a few groups at the UW who can offer guidance on appropriate ways to engage with communities. 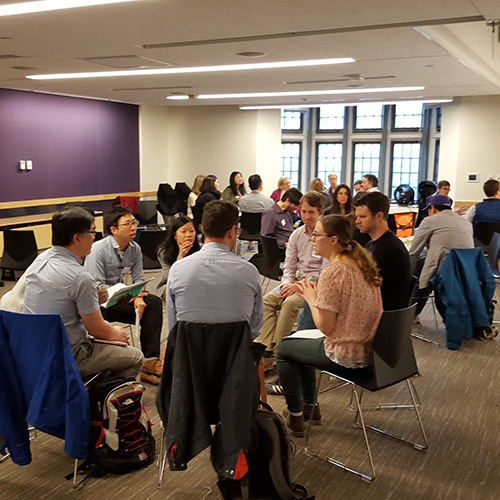 As community engagement is a core part of the UW’s mission, a working group has been assembled to lead the UW’s application for the Carnegie Foundation’s Classification for Community Engagement. Pursuing Carnegie Classification will enable to UW become more intentional and systematic about how to develop effective and equitable community engagement infrastructure in alignment with national best practices. The Harm Reduction Research and Treatment Center works collaboratively with substance users, community members and organizations to develop conduct, evaluate and disseminate evidence-based interventions that help reduce substance-related harm. The Center provides training for students, communities and researchers on harm reduction. The Indigenous Wellness Research Institute (IWRI) is dedicated to supporting innovative, culture-centered, interdisciplinary and collaborative social and behavioral research and education. They have developed a core set of Principles of Partnership that act as a guide to developing and maintaining relationships with partners. IWRI also hosts a number of research resources that can be used for community-engaged research, including a research ethics curriculum, research templates and an interactive Community Based Participatory Research Conceptual Model. The Latino Center for Health provides leadership for community-engaged research through capacity building and authentic partnerships with community stakeholders to improve the health and well-being of Latinx communities in Washington state, regionally and nationally. The Northwest Center for Public Health Practice brings together academia and practice communities, with a particular focus on public health practitioners in Alaska, Idaho, Montana, Oregon, Washington and Wyoming. Services include courses, evaluation templates and evidence-based practical tools for community engaged-research. This article describes key principles of community based participatory research applied to public health. Promotes health equity and social justice through partnerships between communities and academic institutions. A number of opportunities for training are available, including an online curriculum on community-based participatory research. A free, online resource for those working to build healthier communities and bring about social change. It offers tips, tools and resources for taking action in communities. The Population Health Initiative seeks to bring the university community and partners together in more interdisciplinary and collaborative ways to improve the health of people here and around the world. A potential barrier to realizing this goal is the appearance of inconsistent criteria in recognizing interdisciplinary and collaborative research, teaching, public scholarship, mentoring and community engagement for faculty promotion and tenure. This concern, which is shared by faculty and leadership across the university, was a key focus of the UW Faculty 2050 project, an ongoing effort to strengthen the UW as a public institution of higher education. One of the major outputs of the UW 2050 effort was the initial analysis and identification by Drs. Janine Jones and Carole Lee of some of the best practices currently being utilized to acknowledge collaborative and interdisciplinary research, teaching and community-engaged scholarship in promotion and tenure guidelines at the UW. Being transparent about promotion and tenure criteria to new faculty. Identifying unit-level examples of collaborative, community engaged efforts that are aligned with exemplary research and teaching and including these as appropriate metrics in promotion and tenure review process. Defining the values that matter most within the unit based on current and past trends (i.e., sharing what typically drives the discussion of promotion and tenure files). Identifying the range of pathways by which faculty have been successful in securing promotion and tenure (by job class). Ensuring that mentoring committees establish a regular communication routine between the junior faculty member and their faculty mentors. The Population Health Initiative has compiled a directory of physical spaces on the Seattle campus that can be used for teams engaged in collaborative work. The UW Office of Research has compiled a listing of equipment, facilities and services currently available to the UW research community. Each resource has a detailed profile page containing a description of the available equipment, facilities or services, as well as contact information. Looking for a partner for a grant application or a project? Interested in finding a collaborator for a publication or an idea? Sign up for our Mailman email list manager, which will allow you to receive, and take part in, discussions with other University of Washington faculty, students, and staff interested in population health. The UW Bothell Office of Community-Based Learning and Research builds relationships between the university and the extra-campus community through community-based learning and research. The Board of Deans and Chancellors issued a statement on collaboration in May 2014. The Center for Health Sciences Interprofessional Education, Research and Practice advances interprofessional teamwork to improve patient safety and quality in healthcare. The Office of Global Affairs is the University’s hub for global engagement, supporting partnerships across campus and around the world. UW Bothell and UW Tacoma have similar offices. The Health Sciences Library offers tools that can aid researchers in identifying collaborators and team science resources. The Office of Research offers faculty and staff a number of collaborative tools and networks to support the research enterprise.